I was only exposed to chicken nuggets when I moved to the UK and as you can imagine, I absolutely fell in love with them! Crispy on the outside, soft on the inside and full of flavour. You can easily understand why every kid in the country is obsessed with them! As delicious as they are, chicken nuggets aren’t exactly known for their nutrition content. Unless homemade, they’re heavily processed with lots of other unwanted added ingredients. Many tofu recipes use frying as a means to prepare it, but I’ve found that baking tofu gives it a much firmer and chewier texture. 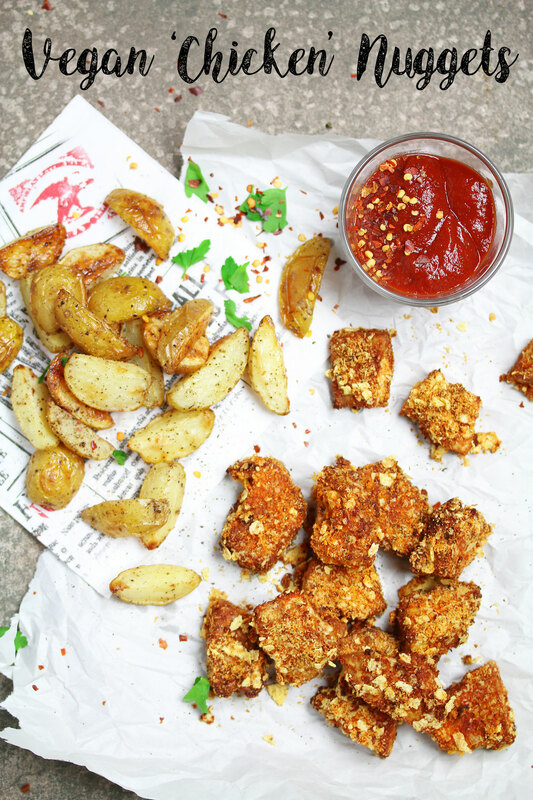 Frying tofu means it’s exposed to heat for a less amount of time leaving it soft and soggy – a texture I’m not a huge fan of. Baking tofu also means it’s healthier with less fat, which is never a bad thing. I used a simple mixture for the coating of ground almonds, garlic powder, paprika and chilli powder. 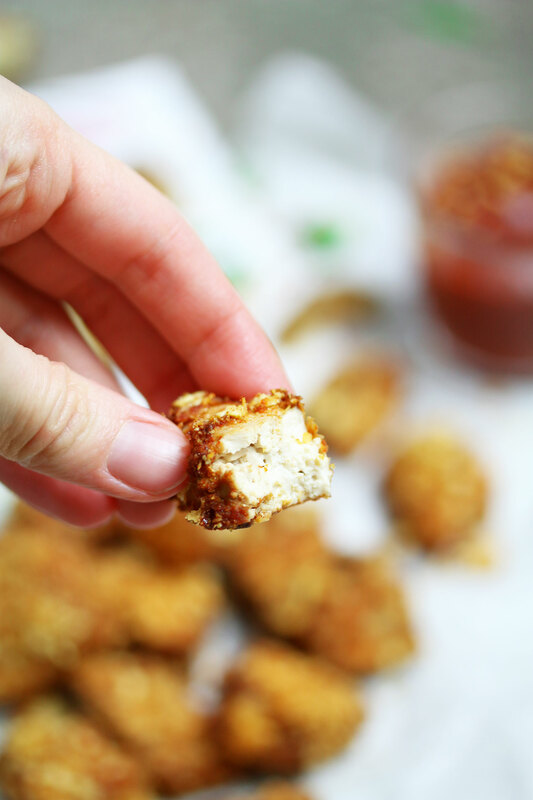 To make these vegan tofu chicken nuggets even crispier, I used some crushed up gluten-free cornflakes to give the coating that classic crunch that fried food is known for. 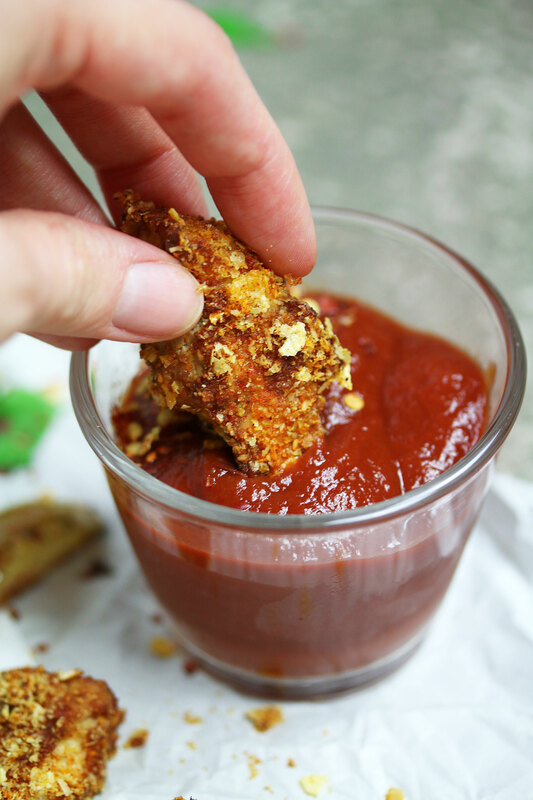 This recipe is perfect as a Friday night treat with a side of homemade chips and some veggies. Perfect balance of protein, carbs and greens! Drain the block of tofu according to pack instructions. 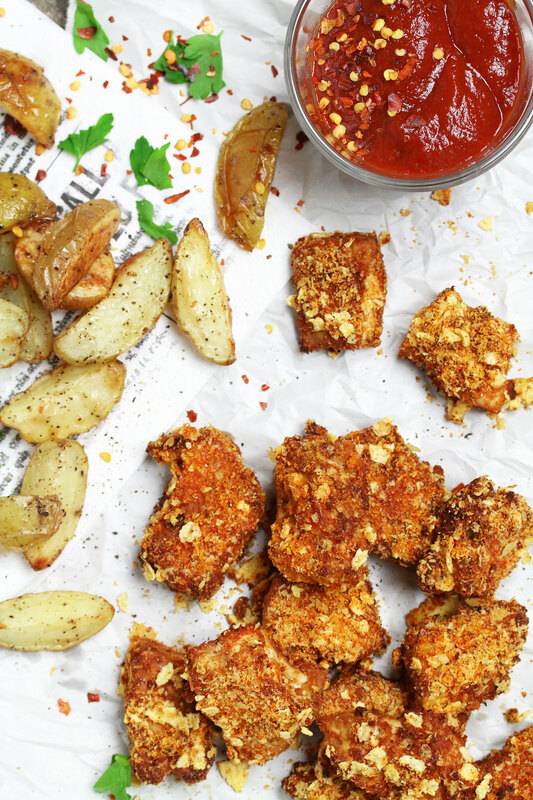 Break up the tofu block into uneven chunks (to mimic the look of chicken nuggets) or slice into cubes. In a bowl, mix together the tamari and lemon juice. In a separate bowl, mix together the crushed cornflakes, ground almonds, garlic and spices. Add salt & pepper to taste. Dip each tofu piece into the tamari bowl, then roll in the coating ensuring they’re evenly covered. Place on a baking sheet covered with parchment paper. Bake for 20 minutes or until the coating is golden brown. Enjoy with a side of homemade potato wedges or sweet potato fries and some veggies! Such a fun way to make tofu! They look really crunchy and delicious, Nadia. 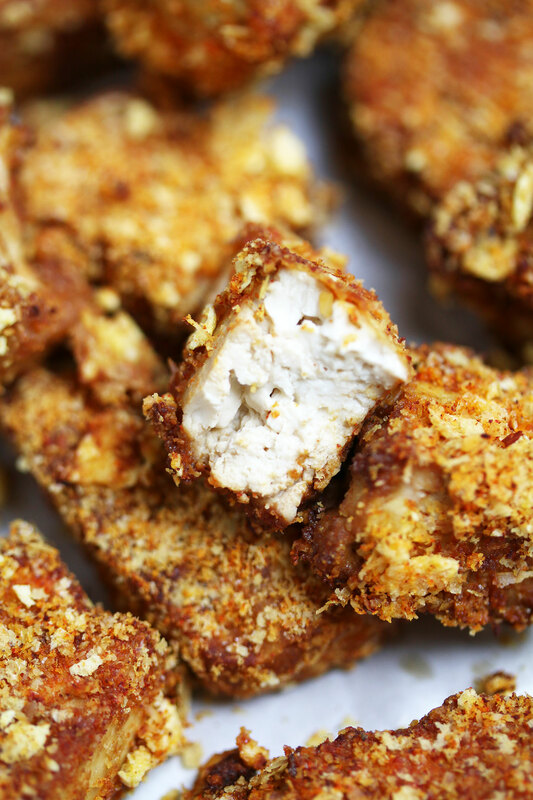 Could I use panko bread crumbs instead of cornflakes? I tried it with the Panko crumbs and they were delicious! I cut the drained tofu into triangles because I didn’t want to make them look like chicken nuggets. They make a great appetizer. 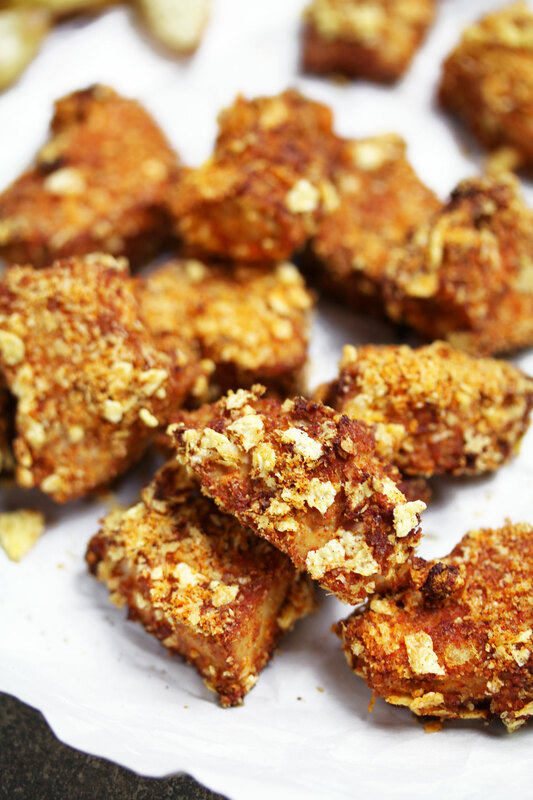 I may try them next time with cornflakes….but the Panko worked fine.